ST. LOUIS—Workers and their allies had a good night last night as they killed so-called “right to work” in Missouri and in Ohio fought a Trump-backed congressional candidate to a near draw in a gerrymandered district that the president won by double digits in 2016. The right-to-work for less law in Missouri went down by a two to one ratio while the Trump-backed candidate in Ohio’s 12th CD is hanging on by a thread; a 1,700-vote margin with thousands of provisional and mail-in ballots yet to be counted. With 78 percent of all precincts reporting, there were 725,663 “no” votes — against RTW – and only 368,227 “yes” votes. The result killed the RTW law the heavily right-wing Republican Missouri legislature passed and then-GOP Gov. Eric Greitens signed last year. Indications RTW was going down the drain came very early after the polls closed at 8 pm, CDT. Just 45 minutes later, National Public Radio’s blog reported anti-RTW sweeps in two pro-GOP counties, Franklin County, outside St. Louis – a 3-to-1 RTW loss – and Lafayette County, outside Kansas City. There, GOP presidential nominee Donald Trump won by 7,000 votes two years ago and RTW lost on August 7 by 3,000. “This goes way beyond the labor movement,” an elated Mike Louis, president of the state AFL-CIO, told People’s World in a telephone interview from the jam-packed election celebration. But even after knocking on 800,000 doors in the run-up to the August 7 vote, making more than a million phone calls and talking to people at more than 1,000 job sites, the state federation won’t stop there, Louis added. 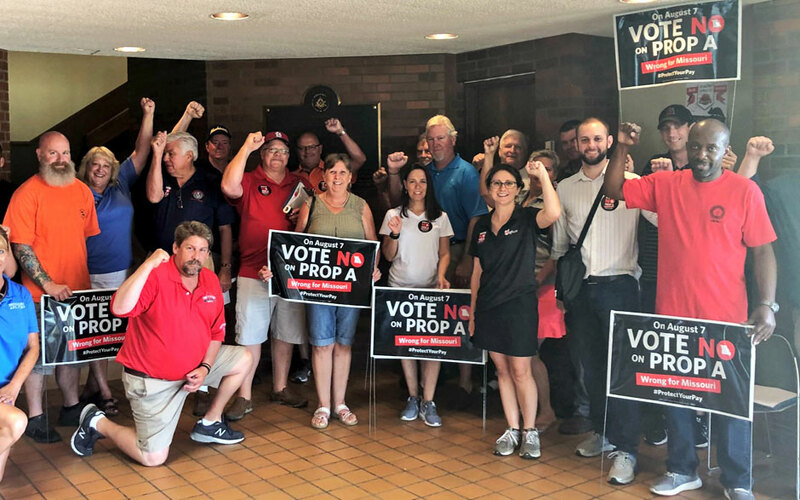 “We thank all the people who put us in this position in the first place,” he said, referring to labor’s community, civic, religious and other allies, as well as the 310,000 people who signed petitions to get the anti-RTW petition on the state ballot. “But those who stood up for corporate America instead of looking after their constituents had better be looking over their shoulders,” Louis said. Outside special interests, a right-wing business executive from the extremely conservative southwestern Missouri city of Joplin and Greitens – whose “dark money” campaign committee raised and spent $2 million – funded the RTW effort. But, in an upset, they were actually outspent, as well as outworked. Progressives got a second big win in Missouri. 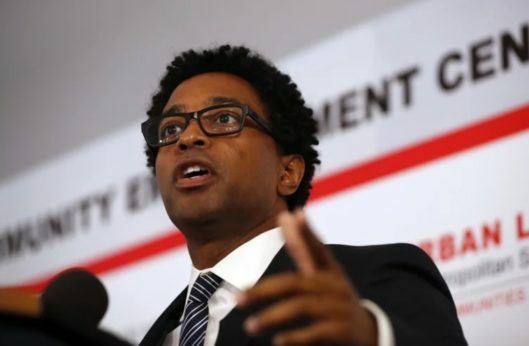 Ferguson City Councilor Wesley Bell, an African-American, ousted St. Louis County District Attorney Bob McCulloch, a 27-year veteran who was unopposed four years ago. McCulloch drew criticism for basically whitewashing police officer Darren Wilson’s fatal shooting of unarmed African-American Ferguson resident Michael Brown in 2014. “People keep saying ‘you shocked the world,’” Bell told the happy crowded watch party. “No, we shocked the world. People showed up and showed out.” Criminal justice reform was his big issue. Trump’s campaigning wasn’t enough to bring home Republican congressional nominee Troy Balderson, a Trumpite, in a special election for an open Ohio seat stretching from Columbus’ eastern suburbs into surrounding rural areas. With all precincts reporting, in a district Trump won by double digits two years ago, Balderson had 101,574 votes (50.2 percent) to 99,820 (49.3 percent) for Franklin County District Attorney Danny O’Connor, the Democratic nominee and 0.6 percent for a Green Party candidate. The race is labelled as too close to call because there are at least 3,400 provisional ballots yet to be counted and perhaps 5,000 mail in ballots that must be accounted for. If the additional counts pull the race within 0.5 percent, there’s an automatic recount. In any case the candidates must run again in November when observers agree that chances of an outright O’Connor victory are greater than they were last night. 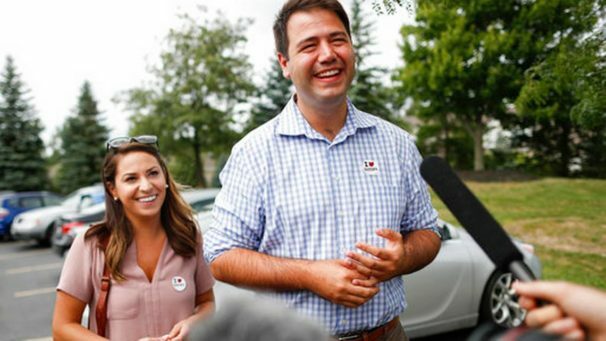 Win or lose, the Ohio result recalls that in Pennsylvania’s southwestern-most congressional district earlier this year unabashedly pro-labor Democrat Connor Lamb eked out a win in a district Trump carried by 20 percentage points in 2016. Both districts were so gerrymandered by Republican legislatures that they were considered permanently out of Democrats’ – and progressives’ – reach. The Ohio seat last elected a Democrat 35 years ago. And this Ohio race was expensive for GOP campaign committees and their “dark money” corporate interest allies. They plowed in more than $5 million. Teamsters attorney Brent Welder narrowly lost the Democratic primary race in the Third District, based in Kansas City. “Our message of bold progressive values and not taking corporate money is resonating across Kansas and across the country,” he told the chanting “Yes, we Kansas!” crowd as returns came in after midnight, but before the totals turned around. 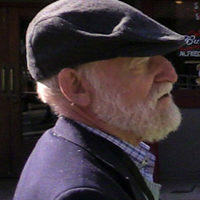 Welder’s platform included Medicare for All, a $15 minimum wage and opposition to “right to work,” which is law in Kansas. The big story in Kansas, however, was in the Republican gubernatorial primary. There, Trump-endorsed, and made robo-calls for, controversial extreme right-winger Kris Kobach, the GOP Secretary of State, who challenged incumbent Gov. Jeff Colyer. Kobach has become nationally infamous for writing anti-Hispanic state legislation – for Kansas and elsewhere – and for his extreme anti-minority tilt as chair of Trump’s “election fraud” commission, which never found any fraud. With all precincts in reporting, Kobach led Colyer by 191 votes out of 311,009 cast in a four candidate race. Each had just over 40 percent. Democrats and progressives were openly rooting for Kobach to win, figuring he’s too extreme even for the Sunflower State’s electorate, therefore boosting Democratic chances in November. The winner of the GOP race faces Democratic state legislator Laura Kelly in November. The Michigan Democratic gubernatorial primary saw former state legislator Gretchen Whitmer, backed by the party establishment as well as all but one union, win half the vote against two progressive opponents, Dr. Abdul El-Sayed (35 percent) and businesswoman Shri Thenadar (15). El-Sayed got the only non-Whitmer union endorsement, from the Michigan Nurses Association/National Nurses United. All three backed Fight for 15 and promised to roll back the anti-union measures of the last eight years of Republican rule in the Wolverine State. And all promised to fix Flint’s water, where Republican cost-cutting led to a public health catastrophe – lead – in the drinking water. But El-Sayed also pushed Medicare For All – NNU’s top cause — tuition-free public college education and other progressive issues backed by the Bernie Sanders wing of the Democratic Party. Whitmer faces Attorney General William Schuette, who tied himself to Trump and won half the GOP primary vote.